2 x KV vari width ploughs with 28” mould boards with a packer maxi mack. We have a variety of cultivators in our fleet to cope with the different soil types and different weather conditions. 4 metre Knight M Press one pass. 6 metre Lemkin min till cultivator. 4 leg sub-soiler with rear press. 4 and 6 metre power harrows. All machinery will suit a variable amount of soils. Verdistate 4 metre drill, an accurate machine, for direct drilling of grass or straight forward cereal drilling. Powerhouse 4 metre combi drill to cover welter years and liked by a lot of farmers. Trailed 8 row KV maize drill disc coulters and very accurate precision drilling. 2 x 6 row KV mounted drills with Suffolk coulters, good for the small field with lots of corners. 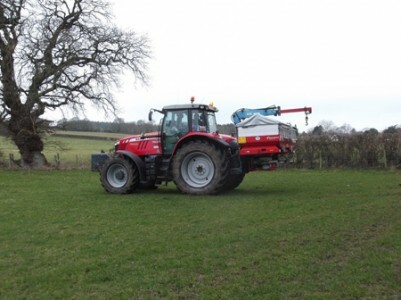 Self-propelled Bateman RB25, 24 metre booms with 2 sets of wheels. There is no better machine for the job! It has a variable wheel width which is ideal for maize spraying without running on growing plants. 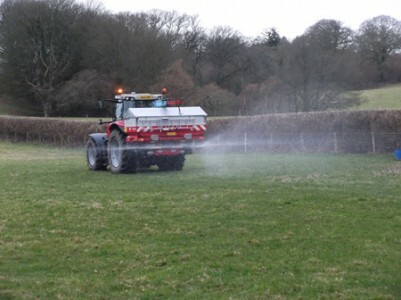 Fertilizer spreading with KV spread and mounted crane. We are self-sufficient to spread by ourselves. We can load and spread. We are self-sufficient to spread by ourselves, loading and spreading.